The GAP cafe in inner-city Melbourne lures potential greyhound owners with 'puppachinos' and homeless hound profiles. When new greyhound owner Kaitlin Maskel walked into The GAP Cafe one afternoon, it was just before closing time. Even though it is only a two-minute walk from Flagstaff Station, it is the kind of cafe that serves up complimentary “puppuchinos” to their canine customers. After a quick chat with the barista, Maskel knew she would be back with her new greyhound, the only dog she has ever had. Earlier this year on the 14th of March, the Greyhound Adoption Program (GAP) officially opened The GAP Cafe to raise awareness about the increasing number of greyhounds in need of a home. 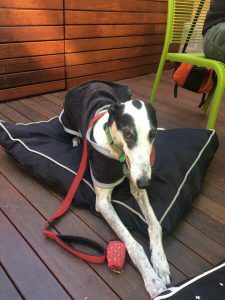 The GAP Cafe gives its customers the opportunity to adopt a greyhound from GAP’s adoption centres in Seymour and Baxter, using tablets to display the profiles of available greyhounds, including ex-racers, ex-breeding dogs, or hounds who have been abandoned. Along with their newly opened cafe, the organisation hosts a number of awareness events. The recent National Greyhound Adoption day resulted in 212 adoptions, and 68 hounds re-homed in Victoria alone. One of GAP’s canine customers. Photo: Rebecca Borg. Stout fostered and then adopted her own greyhound Sasha through GAP, and wanted to give back to the organisation. “Giving up a little bit of time to volunteer or to promote the breed or to just help out on the day… if that means that more dogs get adopted and that more people learn about the breed then that’s great,” she told upstart. In the past, it wasn’t that easy to spread the word. Now, with an adoption site situated in the heart of the city, more people have access to learning about the breed. Stout also believes that the increase in adoption rates contributes to the growing greyhound trend. “GAP do a really good job at promoting the breed and promoting them as really just sort of pets for everyone. I think that really helps,” she said. There appears to be a common stereotype associated with greyhounds. Their racing nature can portray them as aggressive, but through education, GAP works to subvert these misconceptions. The many laws associated with owning a greyhound can also influence social attitudes to their presence, such as the Victorian muzzle laws. But despite this, people familiar with the breed say greyhounds are gentle and placid mammals that just require some extra training in order to adapt to their new domestic lifestyle. Since she has never owned a dog before, GAP customer Kaitlin Maskel associated a dog with barking, chasing after balls, and high energy. To her surprise, she found her greyhound to be the complete opposite. “She doesn’t make a fuss, she doesn’t bark, she’s very quiet. Our neighbours didn’t know we had her for a while,” Maskel told upstart. Kaitlin Maskel’s partner, Trent Bissett agrees that a greyhound temperament suits their lifestyle. “Greyhounds are good apartment dogs because they don’t need to take long walks. They sleep a lot and do that sort of thing,” he told upstart. While Maskel and Bissett sipped at their lattes, their hound slurped at a “puppuchino”, served in a cup by her own personal waiter. “Considering this is my first dog, she’s really a dream dog. I just love her,” Maskel said. 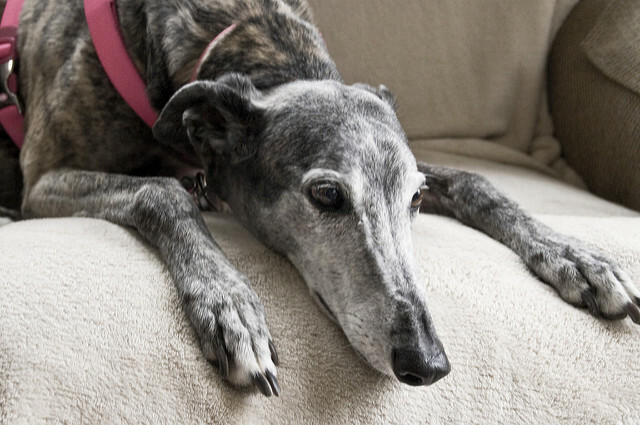 Photo credit: ‘Greyhound’ by Liz West available on Flickr, under a Creative Commons Attribution 2.0. Full terms at http://creativecommons.org/licenses/by/2.0.